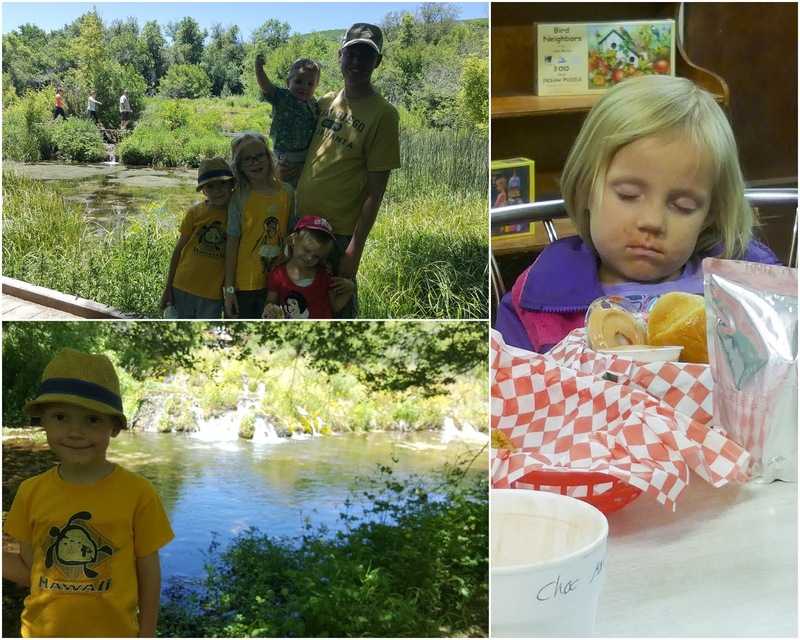 We enjoyed our annual stay in Heber City with our dear friends, the Easons. 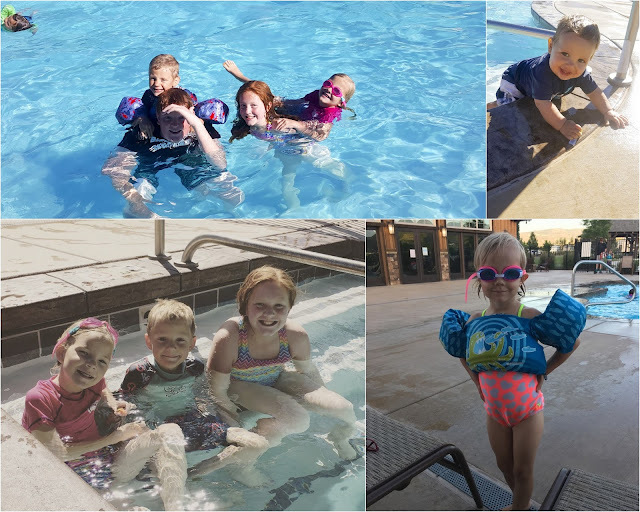 The kids had a blast playing in the pool and hot tub. Just like we used to do in Texas. 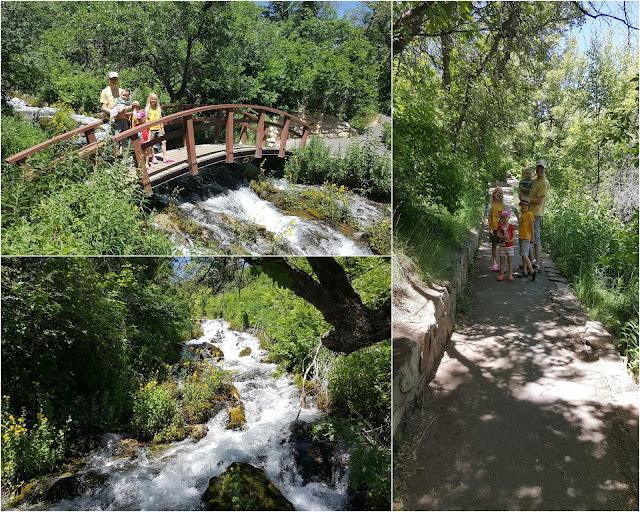 We started our vacation with a visit to Cascade Springs. The trail meanders through a number of pools created by underground springs reaching the surface. The vegetation was really green and lush with some areas of marsh. The kids got to recognize some indigenous plants they've seen around. They were several types of Columbine in bloom. 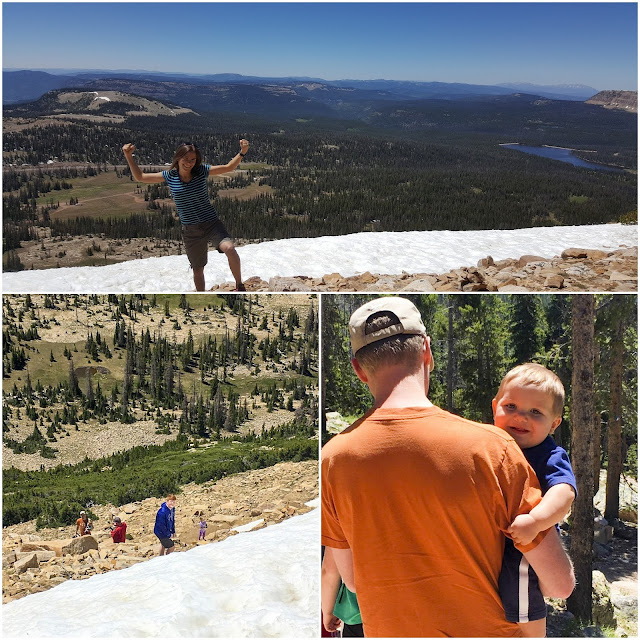 The next day we tackled a more difficult hike, Bald Mountain. At 11,943 feet, Bald Mountain is the highest peak in the western Uinta's. The hike is 2.6 miles long RT and has an elevation gain of 1145 feet. Simply put, it's like climbing stairs the entire way up. Todd got to test the backpack carrier I purchased for Andrew. He did all-right but was pretty winded by the end. I don't blame him. He was packing more than 30 lbs on his back. We made it close to the top but were stopped by a bank of snow that hadn't yet melted which blocked our way around the mountain and made the terrain muddy and slippery. The only option to reach the top was to rock climb a short way up to the top. Nicole, Claire and I decided to try it. The hardest part was climbing in the snow. My shoes did fine. But I had to lean forward and set my hand on the snow to grasp for support as I hoisted myself up to the top. My fingers were frozen by the time I reached the top. The view from the top was incredible. The way down was a little scarier. I went first and had to just slide on the snow to get down. Claire followed behind. We were both sitting on a large flat boulder when Nicole followed us down. She came down a little faster than expected and bumped into us. There was a second there when my heart froze as I scrambled for something to grab so I wouldn't fall down the side of a mountain. 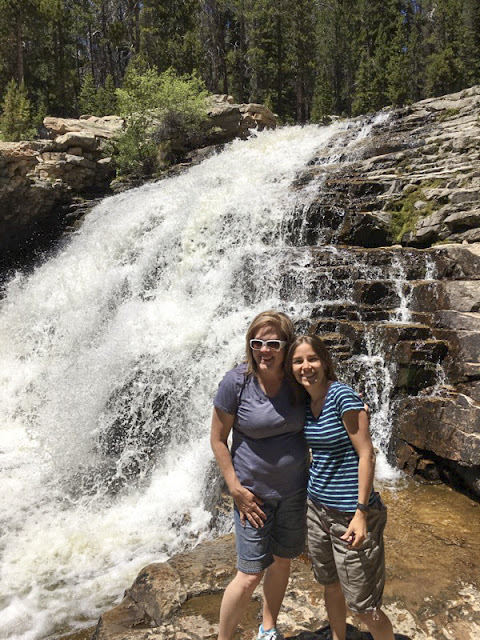 On our way back to Kamas, we stopped to see the Provo River Falls. The kids climbed all over the path and near the water for a while. By the time we arrive to Kamas for lunch it was after 2pm. We stopped at Hi-Mountain Drug. It was an old pharmacy converted in to a hamburger joint. The food is incredible. It was voted the best hamburger in Utah a few years ago. Even at 2pm the place was packed with people. By the time they got our food out, Stella had fallen asleep in her chair. 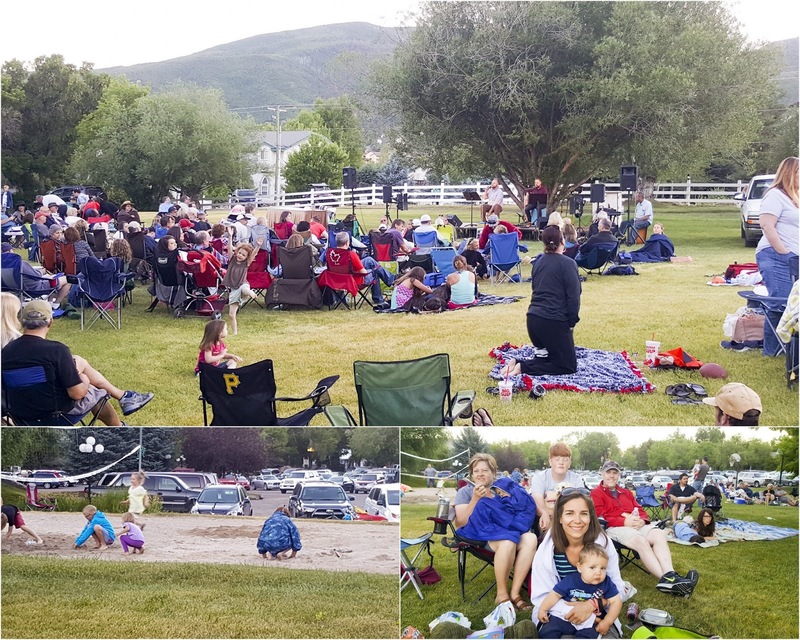 Every weekend during the summer months Heber city park has variety of events. The day we were there, they were setting up for their annual car show. 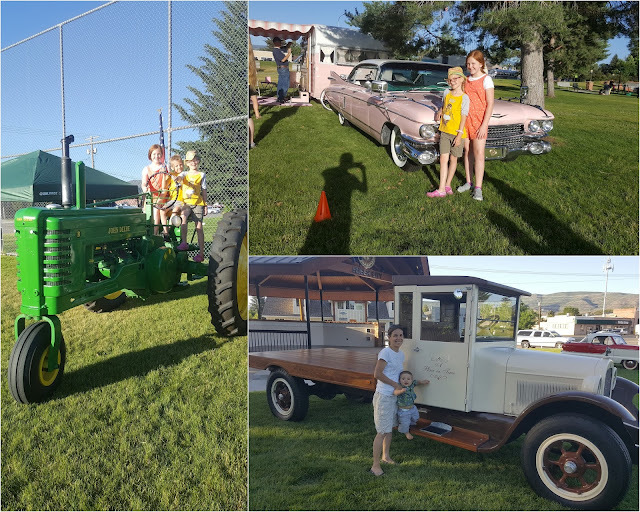 They had several antique cars and matching RV's completely restored. The interior of the RV was decorated with period pieces - down to the Tupperware and food packaging displayed on the table. My favorite was a 1926 delivery truck. The interior and bed were made of wood. I loved the smell of the stain (weird, I know!). The vehicle was almost 100 years old and is still running. Of course, the owner had to do a lot of work to get it to it's current state. It was darling! That evening we went to the Zermatt hotel in Midway for a folk Beatles concert in the park. The kids enjoyed playing in the sand and singing along to some of their favorites. And, if that wasn't enough, we went back to the RV resort to roast marshmallows and have some s'more's. 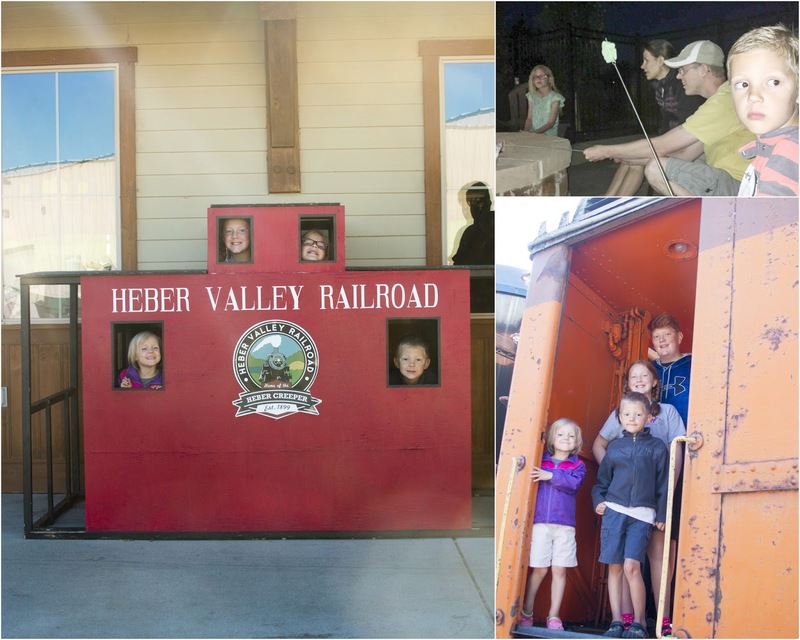 We chose stop by the Heber Valley Rail Road and check out the station. We've ridden the train several times, and decided to pass on it this time. The kids still got to climb on some passenger carts and admire these beautiful machines. 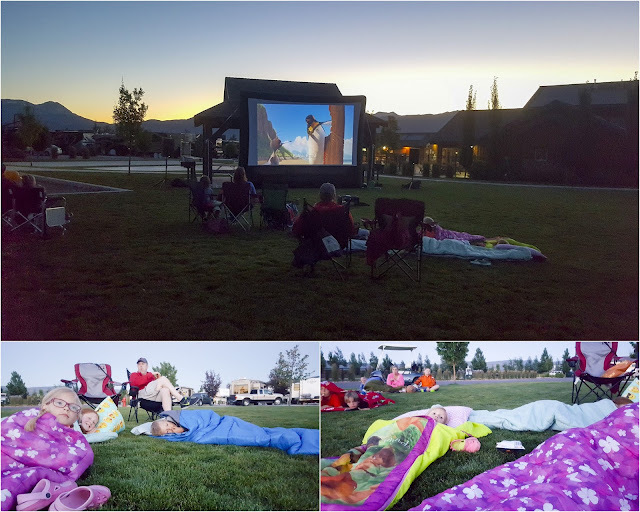 That evening the RV resort had an outdoor movie playing so the kids got their sleeping bags and laid on the grass to watch Surf's Up. This years we opted for staying in the cabins. They each have two rooms and sleep 6 people. They do not have bathrooms, so you have to walk across the grass to get to the bathrooms - not fun to do with a kid in the middle of the night - but aside from that they were great. In fact, they are located right across from the pavilion and club house so they are really close to all of the amenities. I really liked that. They don't have kitchens, only a mini fridge and a microwave so we had to eat out most meals, but that wasn't too bad for a 2 day stay.